Having a well-lit space is essential for your family’s safety and efficient completion of tasks. 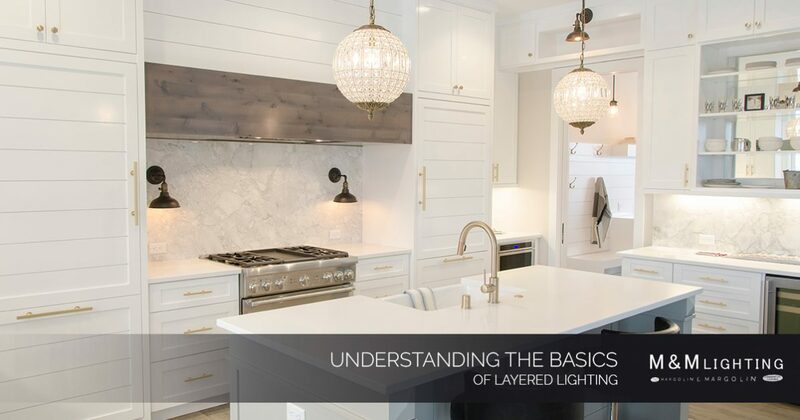 If you have ever shopped for light fixtures or spoken with a lighting expert about design options, it is likely that you are familiar with the importance of layering different types of lighting in a room to create a perfectly illuminated space. Incorporating multiple layers of lighting into a room is easy, and in today’s post, we’ll review the three main categories of lighting: ambient, task, and accent. We’ll also review how you can use these layers to customize the level of light in a space. Read on to learn more! Are you shopping for lighting solutions? M&M Lighting in Houston has all of your needs covered. Browse our online catalog now or swing by our Top Rated Local® lighting showroom today to view hundreds of interior lights in person and speak with a friendly member of our team! As the most basic type of illumination, ambient lighting provides a room with general illumination. This category of lighting is essential in every room as it allows us to move around in the space safely and perform general activities with ease. Sufficient ambient lighting can be accomplished with well-selected chandeliers, ceiling lights, and floor lamps. As its name suggests, task lighting provides the necessary illumination for completing everyday tasks in a room. In a bathroom, it is important for putting on makeup. In a kitchen, it provides the needed lighting for chopping and cooking. In the living room or den, it allows us to complete tasks like reading and studying easily. Task lighting can be accomplished with vanity lights, pendants, and table lamps. While accent lighting is not essential to safety or easily completing everyday tasks, it is equally important in interior lighting design. This type of illumination is used to highlight various items, such as a piece of art or sculpture. It can also be used to accentuate certain architectural features like shelves or alcoves. This type of lighting design can be accomplished tastefully with sconces, pod lights, and other types of directional lighting. When it comes to effective lighting design, incorporating all three layers in a room is essential for balanced and functional illumination. In order to get the most out of your interior lights, it is beneficial to control each layer of light separately. Doing so allows you the flexibility of choosing which type of light you need for any given task at hand. Additionally, incorporating dimmers into your controls provides an easy way of setting your desired amount of light in a room. Interior Lights and More for Houston! Whether you’re shopping for ambient, task, or accent lighting solutions, M&M Lighting is sure to have the right fixture for you. 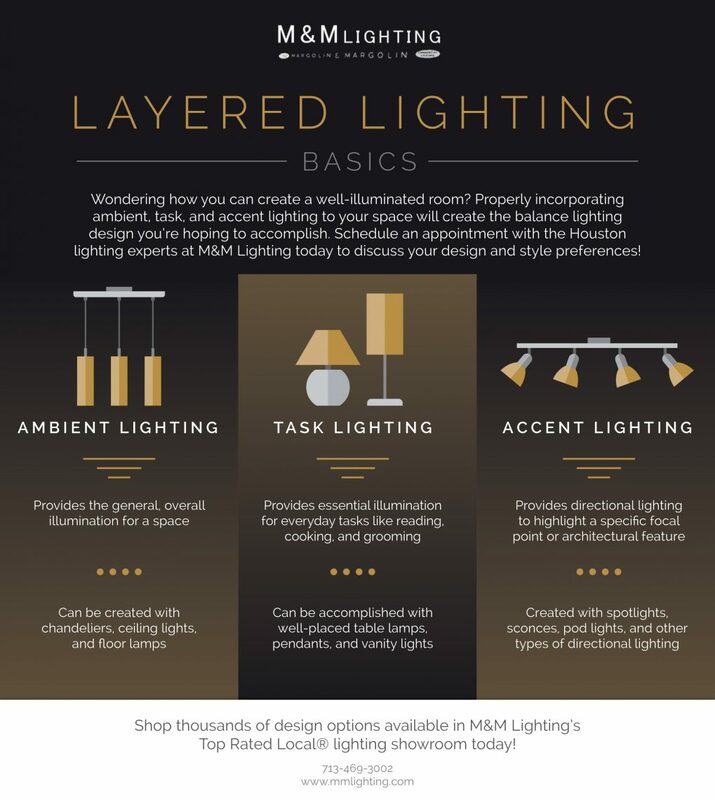 If you’re uncertain about how to best illuminate a space in your home, our lighting design experts would love to speak with you about how to properly layer interior lights to best suit your needs. Call 713-469-3002 to speak with a friendly member of our team or visit our showroom at 5620 S. Rice Avenue in Houston today!